Is Nelson Mandela's funeral the biggest in history? 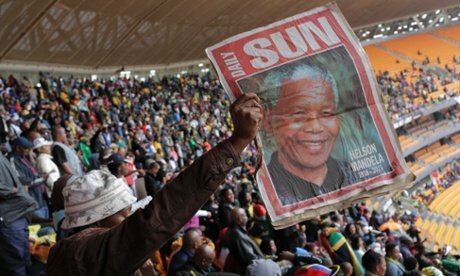 Home World Africa news Is Nelson Mandela’s funeral the biggest in history? Is Nelson Mandela’s funeral the biggest in history? Nelson Mandela’s memorial service in Johannesburg was attended by 52 presidents and 16 prime ministers on December 10, 2013. Although the stadium had empty seats, a live broadcast was beamed into three other venues, and there were more than 100 public viewing areas across the country. Between now and Nelson Mandela’s burial on Sunday, thousands will line the streets to see his coffin pass through Pretoria. Although crowd estimates should always be treated with caution, the largest funeral attendance in history is widely thought to have happened in 1969 when 15 million people reportedly took to the streets of Chennai for CN Annadurai, the former chief minister of Tamil Nadu. CN Annadurai’s popularity was partly due to his brilliance as a writer and speaker, says Tamil expert MSS Pandian, and the fact he founded a separate linguistic identity for the Tamils by rejecting Hindi as the national language. According to the Guinness World of Records, the highest percentage of mourners in any country came 20 years later, when one in six Iranians – about 10 million – witnessed the coffin of Ayatollah Khomeini being carried through Tehran, amid chaotic scenes in which several were crushed to death. For sheer political magnitude, there was also Pope John Paul II‘s funeral in Rome in 2005, when about 200 world leaders were among the 250,000 people gathered in St Peter’s Square. A huge television audience estimated to be in the billions watched the funeral of Princess Diana in 1997.